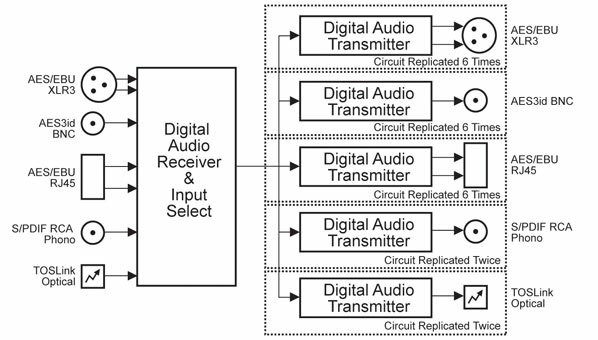 RB-DDA22 Digital Audio Distribution Amplifier With Multiple Outputs. The RB-DDA22 is a multiple input and multiple output digital audio distribution amplifier designed to accept one of 5 different digital inputs and output to 22 digital audio outputs of 5 different connector types. It is used for distributing digital audio data in many formats, repeating both the audio data and the status information of the input whilst re-clocking the data and re-normalising to the appropriate standard digital audio levels. The RJ-45 connectors are wired to be StudioHub+ compatible, a format defined by Radio Systems Inc. Applications include distributing audio from a digital mixing desk to multiple digital recorders, or feeding multiple studios with an output from a USB audio player. It can accept input sample rates in the range of 30kHz - 200kHz, and bit rates of 16, 20 and 24 bit. So, it can be used for standard CD signal distribution at 16 bit 44.1kHz, as well as for high quality 24 bit 96kHz or 192kHz recording. The front panel has an INPUT SELECT button and 7 indicator LEDS. The button is used to select the input to be used and shows the mode of operation of the unit. The LEDs will indicate, depending on the mode of operation, the input selected, valid signal presence, or the operational frequency. In ‘operating mode’, the central button LED is unlit. The unit selects this mode when a valid input signal has been present and no button presses have been made for 8 seconds. The LEDs around the button illuminate amber to directly indicate the following frequencies 32, 44.1, 48, 88.2, 96, 176.4 & 192 kHz. If the input is at a non-standard frequency then the unit will indicate both the frequencies either side of the incoming frequency – e.g. if the input signal has a frequency of 64kHz then both the 48kHz and 88.2kHz LEDs will be illuminated. If the frequency is below 32kHz or above 192kHz then the appropriate LED will flash. Pressing the INPUT SELECT central button illuminates it red and allows you to select the required input. Pressing the button will step the selected input to the next input selection including auto mode. Note: Input Select mode is chosen automatically when the selected input is not present. In this special input select mode the unit will hunt through all the inputs until it finds a valid signal. If multiple signals are present you can force selection of the next input by holding the input select button down for 2 seconds, when the next valid input will be selected.